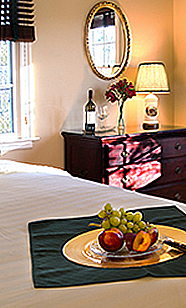 Here at Foxfield Inn, in Charlottesville, VA, our lodging accommodations consist of five beautiful and unique guestrooms thoughtfully decorated to anticipate your every need. 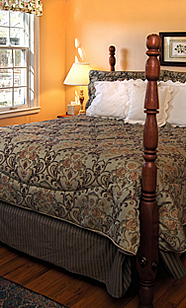 Choose one of our deluxe rooms with gorgeous views of our park-like yard. 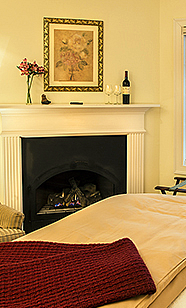 Four of guestrooms have gas fireplaces and Jacuzzi tubs to help you relax. 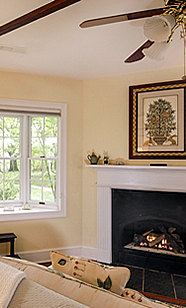 You can even hook your iPod to the Bose sound system in the room or borrow a CD from our extensive collection. All of the rooms have fine linens, two types of pillows, comforters, plus robes and slippers for you to use while here in addition to complimentary Wi-Fi, irons & ironing boards, and hair dryers. 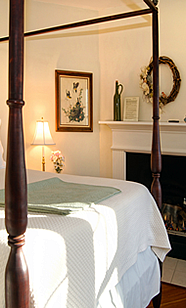 Our inn is a ranch-style house so all guest and common rooms are on one floor – no stairs to lug heavy suitcases up and down! No matter which room you choose, be sure to enjoy the hot & cold beverages and afternoon treats in the guest pantry. Join us each morning in the Sunroom for an unforgettable breakfast of your choice selected from our daily offerings.